After discovering the talent that create the custom geeky amigurumi from Geek Central Station, I decided to ask them for an exclusive interview. They are from USA, Texas and I will be talking to Sammi, one of the main creator. Hi Sammi, when did you start to create geeky amigurumi and what got you started? I started these little geeky amigurumi about a year and a half ago. I go to a lot of crafty communities (like Craftster.org and Ravelry.com) which just have some amazing stuff in there, and I just decided that there needed to be more geeky stuff there. I like taking traditional crafts, like crochet, and turning them into something modern, like Star Wars characters. Which was the first amigurumi you created? The first amigurumi I made was a hobbit, and it looks radically different from the characters we make today. He was very simple (and honestly looked kind of wonky--I don't think he even had arms) and I showed him to my boyfriend, and he said "We can do better". That was the start of the slippery slope. Among all the amigurumi you have created, which are your favorites and Why? I think my favorites would have to be Gandalf and Altair. Gandalf was one of the earlier amigurumis I made, and I just love the whole look of him. Altair was a birthday present from my boyfriend, so that one might be my favorite because I am always making these for other people and it was great to get one for myself. How long does it take you to work on one amigurumi taking example of your favorite? Gandalf is relatively simple, and would probably take 3-4 hours to complete. Someone like Link, though, who has a lot of detail (both in stitching and sculpey) would probably take somewhere around the 6-7 hour area. That isn't taking into account the research we have to do on new characters, and the time it takes figuring out how we want to translate their look into toy form. They are so many details to make amigurumi realistic. What did you used to create those accessories? Is it true that your boyfriend create all those weaponries and armory for you? Yes, anything that is made out of sculpey is made by my boyfriend. Sculpey is just craft clay that you can buy at the store and bake in the oven to harden. Everything else is just attention to detail, like getting the color of the coat right or making the hair style just right. What about the pattern on the cloak of the Amigurumi? Most of that stuff is painted with acrylic paint, which my boyfriend also does. He does most of the complicated stuff! Have you create any troopers (clone troopers, stormtroopers, Snow troopers)? If not, why not? No, we haven't. Mainly because of the amount of sculpey involved to make their armor would be a little daunting. Boba Fett is a similar character, in terms of how they would have to be assembled, and he takes forever to make! Helmets are also a challenge, so we try and stay away from those. Can your amigurumi hold the accessories such as lightsaber or shield? Unfortunately no. We tried to put magnets in everything but in the end they were just not strong enough. But in return we try and make usable holsters so that there is a place to safely store the work. Every once in a while we will put a stick through them (like the cigar on Hellboy) so that it can be stuck into the character, but in general we don't like doing that to guns or lightsabers because it takes away from the general look of them. Have you work on any amigurumi which is not Humanoid such as Dog or other 4 legged animal? I have made a couple of dinosaurs, but that is about it! Final question. On your GeekCentralStation's Shop, you have move to providing instruction to D.I.Y other than making the amigurumi figure for sale. What contribute to that move? Making all of the custom orders was just exhausting. Most people wanted the same characters over and over again, and in addition to the amount of work involved in each order the repetition of making the same character got boring. Every once in a while someone will ask for something really cool and different, and we will just be so excited about it and decide to make it, but that doesn't happen too often. We also wanted more time to work on our personal collection, which is sadly missing some of the coolest characters. But I wanted people to be able to make their own characters, if they were so inclined, so I put up the patterns. If I couldn't spread the geekiness first hand, I wanted to be able to do it in some way! Here's the previous post of Geek Central Station's work and their gallery on flickr. Great interview, interesting to hear whos behind them. 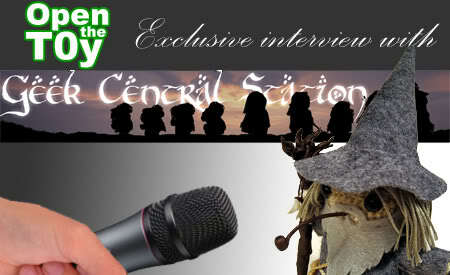 Excellant banner with the mic bigger than Gandalf head and the classic silhouetted followship image. Thx for the link and the exclusive interview. Really interesting to see classic craft works turning to movie characters.